Moderation is great, but sometimes, nothing beats a good old-fashioned gorging. Here are four of the city’s most calorically rich, gluttonously irresistible dishes, built to satisfy your most hedonistic impulses. Devour if you dare Doug’s “Don’t Fear the Reaper” burger. This killer sandwich features four beef patties, four bacon slices, two cheddar slices, a fried egg, an all-beef wiener, Boogie’s signature red sauce and (yes, and) “all the fixings.” $15. 908 Edmonton Trail N.E., 403-230-7070. You’ll need both hands and a spotter to hoist Sherm’s Ultimate Gripper. Its groaning chili-filled bun holds a deep-fried, bacon-wrapped wiener, mustard, banana peppers, sautéed onions, bacon bits, grilled ham and a perfect sunny-side-up fried egg topped with Tubby Dog’s patented “space cheese.” Hold on tight! (Another Tubby delicacy is pictured above.) $9.50. #103 1022 17th Avenue S.W., 403-244-0694. 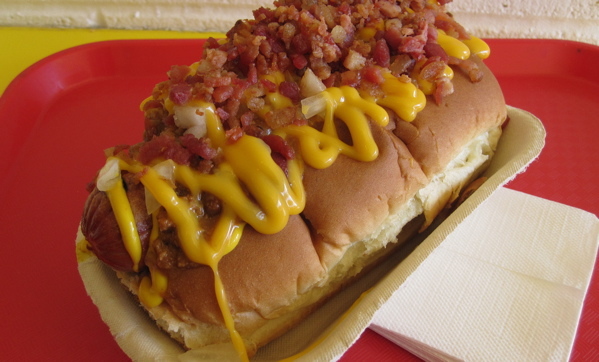 Fast-food shacks are not the sole purveyors of fatty foods. Calories can be haute, too. For proof, try Catch’s braised veal cheek and butter-poached lobster with mascarpone risotto, white asparagus and gremolata. Truly, a meal fit for a (fat) king. $49. 100 Eighth Avenue S.E., 403-206-0000. Trot out that old nugget about skinny French people who eat loads of duck fat; it’ll offer some comfort as you indulge in this heart-stopper. Pulled duck confit with Quebec cheese curd, dried cranberries and gravy: This is duck (preserved in fat) topped with cheese (fat) and gravy (fat). $20. 1111 Seventh Street S.W., 403-228-3771. Image courtesy of Geoff S.